Sometimes you just have to look in your own backyard or garage and you might find something that will work. I have been looking for a dresser and can't find a thing that is remotely what I want. DH said what about the buffet in the garage, I said no, the wood is way too light and it just isn't right at all. Well, to please him I uncovered it and took a look. Just an inexpensive buffet that was in the breakfastroom of my last house. You know what, it is much darker than I remember,and the color looks good with the headboard. So, it will work for now and better than what I had. I really want a lovely bowfront dresser or something with some character, but until I find it, this is free. I pulled out all my new accessories and borrowed a few things from around the house and started playing. I think the aqua color is just right for this room and such a nice refreshing color change for me. For now the nightstand on this side is staying. 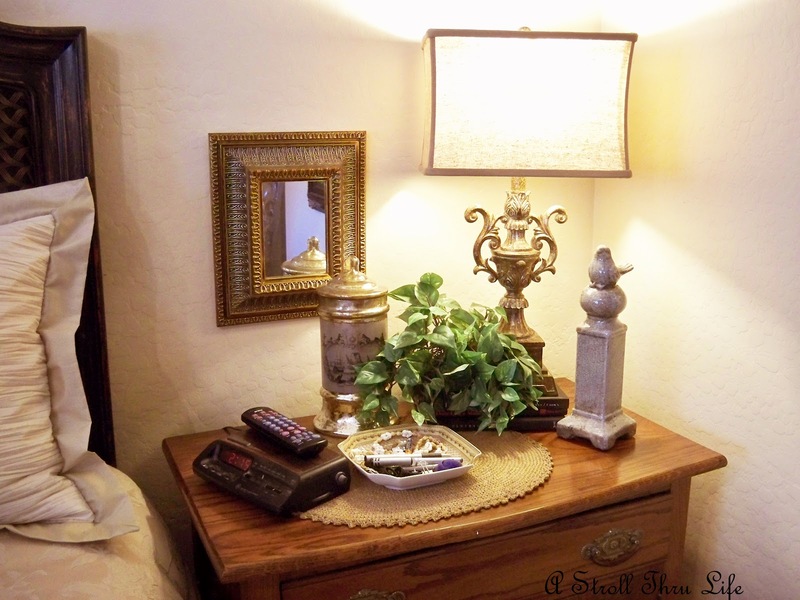 Just a couple of the new accessories that I found on my recent shopping spree and one of the new lamps. I am keeping the same drapes and just a throw and pillows are enough for the settee. It's nice to have a larger chest on this side of the bed and fun to play with more of my new accessories here too. I had the small pedestal in the garage too, so I brought it in and put a fern on it to fill in the corner. The garden stool is the one I painted last year and had on the front porch, the colors were perfect so I brought it in for a place to sit a drink and to hold some of my decorating books. I put a stack of them at the base of the pedestal, nice and handy. 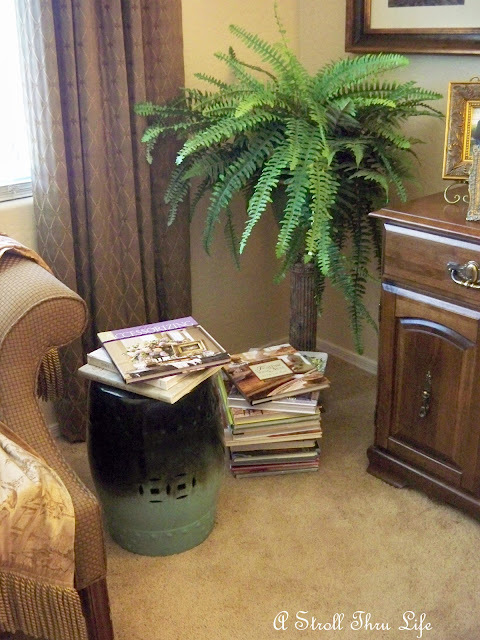 I love creating vignettes that are asymmetrical. I wanted this one to balance out the entire wall area on this side of the bed. The matching new lamp, a couple of candles and family pictures on the chest. The paintings I borrowed from the hall. They both have aqua in them and they are two of my favorites. I took this at an angle trying to avoid the window glare. Love this scene, so precious hugging her dog. I think the headboard is the star of the show. Remember how it looked when I bought it. A little paint and some subtle distressing and I think it totally steals the show. I painted it black, sanded and then went over it with mahogany stain highlighting some areas. Someday I will find that perfect dresser and the room will be stunning, but for now, I think this works just fine. The buffet serves as a space filler while I hunt for just the right thing. The rest of the accessories and buffet I already had, just shopped the house. Just a reminder of the before. The old family pictures are being relocated to the guest bedroom. I love the changes and I think a huge upgrade for $200. I just found a great night stand, so now I only have to find that wonderful dresser. Thanks for stopping by, I always look forward to your visits. The bedroom is looking beautiful. How lucky to have that piece sitting in the garage. I love your vignettes. I love the new look. I like your bedroom changes that you have made. Love the pops of blue to the room now! Your garden stool is perfect for your magazines. That headboard really looks wonderful, Marty! So nice to see how you pulled everything together! Love this room! Your home is always so lovely! So pretty. Enjoy. Thanks for sharing. Have a great day. 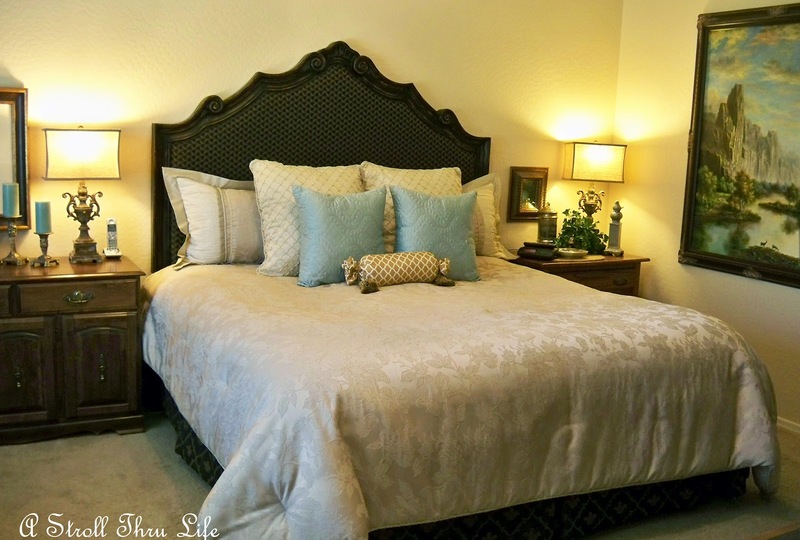 Your bedroom is beautiful....love the addition of the pale blue color!!! I think it looks stunning now! I believe we have very similar buffets...mine is in the DR. I was glad to hear that you are relocating the family pics...I love those. The aqua color is just perfect! You did well in this room and what makes it even better, is the (hardly no cost)at all! FREE is always fun.......I think it looks great. All the little touches of acqua in the pillows, candles and even the art all make it feel so put together and inviting. It is gorgeous! 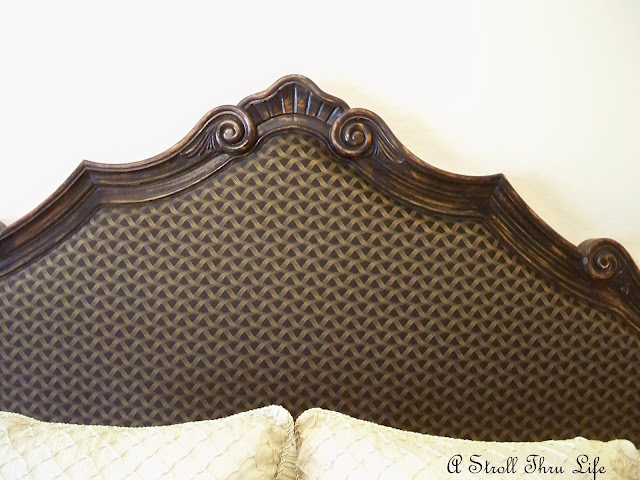 The headboard looks stunning! I love the throw and pillow on the settee! I think your lamps need to come visit my house! This is an amazing transformation! No, I love the new night stand, it is just being refinished, then it will come to live here. Thanks. I love to "shop" in my own home, too. It's always so much fun to re-discover things that you can use. The room looks great! what a wonderful room you've created Marty... You'll surely have sweet dreams in it and I wish them for you.. Your room turned out beautifully, Marty. I love the new art work and would like to see more of that huge painting on the side wall. Your blue accessories really bring out the pops of blue in your paintings, and that buffet does not look like a buffet, but instead fits perfectly in your room. And all for $200; I'm really impressed. Can't wait to see how the night stand turns out. Can you use that sweet buffet on the other side of the room? Just love that buffet! I was at Hobby Lobby yesterday and saw their display of aqua pretties and wanted to take them all home. I decided that the aqua would liven up my neutrals, which tend to get drab at times, so I'm going to go back and pick one up each month and add to my living room. Such a pretty color! Looks wonderful...the turquoise makes it pop, and I love it with brown. Glad to see you have not painted the nightstand. So where did all your ancestors go that was above your headboard? Do they have a new home? All the ancestors are going into the guest bedroom. Still need to do a little fluffing in there. Your room is fabulous. I don't think I'd look for a dresser. Your buffet is a perfect fit, and really pretty. Using aqua as your accent color is great. Everything looks picture perfect to me! Great job as always. Love the changes you made to the room, and the soft aqua is perfect! Marty, that new headboard made a huge difference. The whole room looks wonderful and I love the buffet next to the bed. I love the aqua touches and especially the garden stool. The eye really goes to the lovely headboard. It is inspiring and makes me wish I could get our master bedroom going but we are just awful. I love it, and I don't think you need to change a thing. The aqua really did it too! 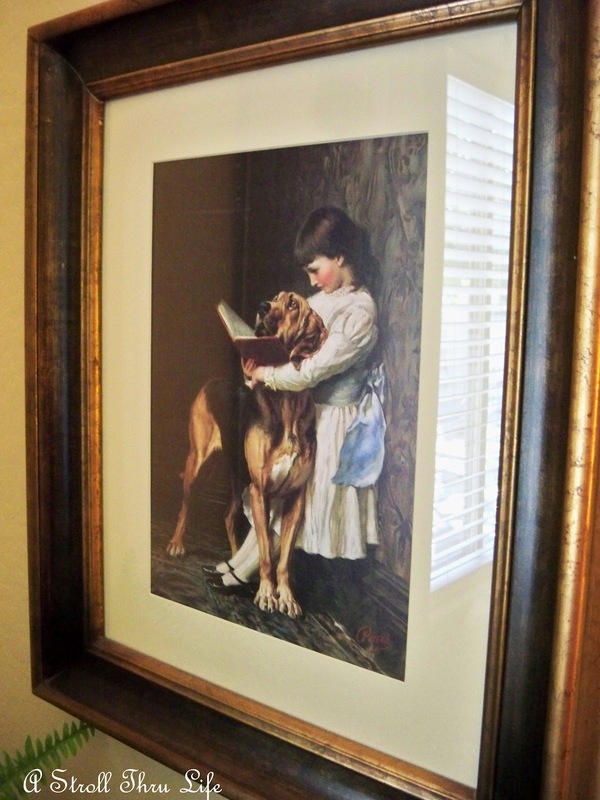 Headboard is great, and that painting with the little girl is just perfect! I'm loving it all! 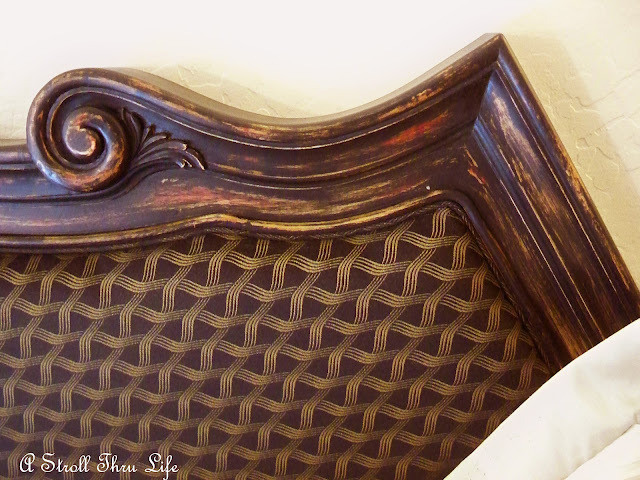 The headboard is fantastic and I love the paintings so much more than the before. Perfect updates and such bargains. You must be so happy! Marty, your new bedroom is more than good, it is gorgeous! I love all the changes, the new and old pieces, it all came together just beautifully! Very,very pretty and elegant! Nice job, Marty. The room looks so elegant! 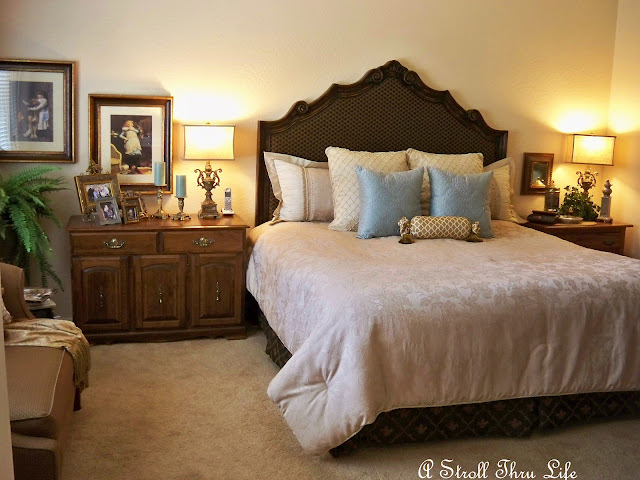 Marty your room looks so elegant, I love that headboard! Great job as always!! What a beautiful transformation! I adore how the sashes in the girls dresses in your prints compliment your color palette! This looks so tranquil...what a Master Bedroom should have...comfort factor! I too have added that soft aqua color to several rooms in my house. I LOVE IT!!! I think your room looks great as usual!!! Now enjoy that new look!! Hey Marty - wow what a change and for so little $$$! It's amazing what we keep in our garages, right? 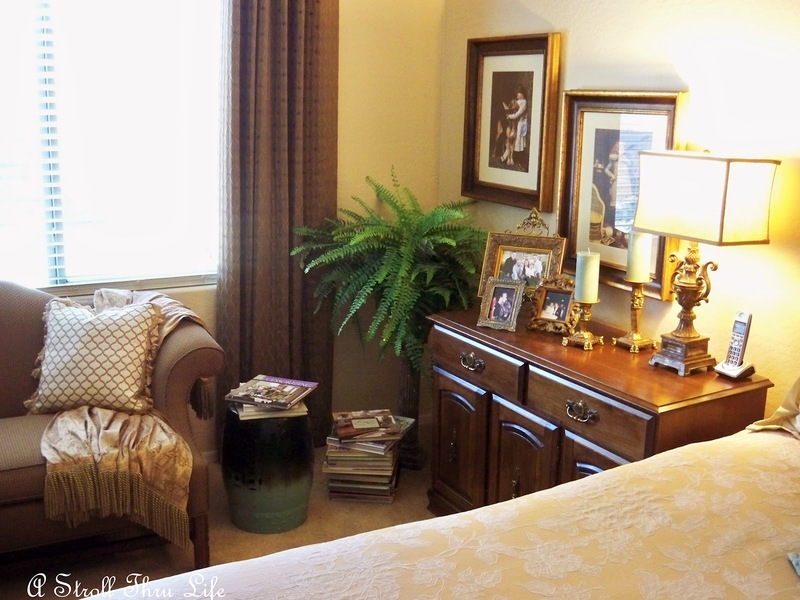 You accessorized beautifully - fills the space so much nicer. An incredible before and after. I might look for an elegant vanity/desk with a small chair(?) You always need something like this. It wouldn't give you storage - but it's longer and perhaps more functional. I was looking at your walls - they are plaster!!! I would give anything for these walls...they are gorgeous. Plaster walls - when painted and glazed - come out so beautiful, much nice than regular sheetrock! Lucky you. I used to live in an old house with plaster walls many years ago - still miss them!! Your bedroom redo looks wonderful Marty! I love the bits of the blue color throughout. Looks pretty Marty, you've done a great job. 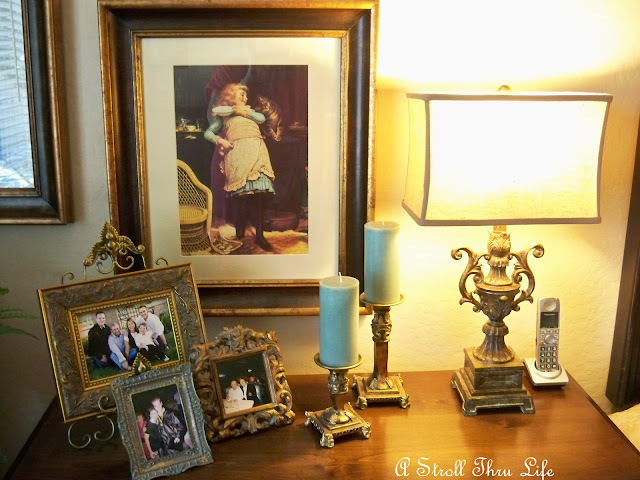 Hi Marty....haven't been by here in ages......I love it when a fellow blogger uses what's on hand to redo a room. Your's turned out lovely...I might add. Wow! It's so pretty! This is a great makeover. I love your new headboard and the pops of blue color really add just the right thing to the room. Your room looks richer now. your room looks awesome! i love all the artwork and love that big headboard! This really looks fantastic, Marty. I love the addition of the blue, it adds so much to the whole space. Of course, you are always so skilled at vignettes and all your tabletops are perfect. I've told you before but I just love that headboard. It looks great. The touches of aqua are just what the room needed. Oh Marty, the room was lovely before, but now it's exquisite! You really have an artistic streak. The garage is such a great place to store the items we push aside for newer things..how can I get my hubby to park his car elsewhere so I can use his space for all the things I want to keep but have no use right now? It's like Christmas shopping all year round! I need my own garage..Lovely setting and yes, the buffet looks wonderful! Marty, your bedroom is beautiful. I love that you have a loveseat in your room....Your changes are perfect and Iove the larger bedside chest too!...You did a fantastic job of re-styling your room! I love all the changes that you've made, Marty. Seeing the before and after really shows the huge difference! 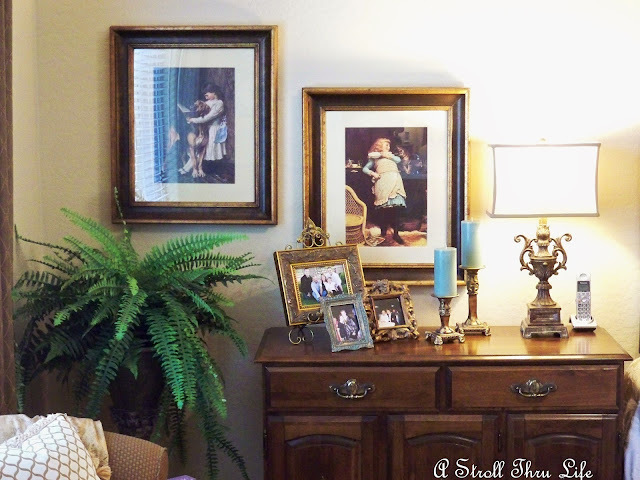 You did a great job as usual Marty....love the buffet, and that whole wall vignette you created! Marty, I love your updated room. The headboard really is a show stopper!! I love how the one painting has some aqua in it to tie into the room. It's so serene and peaceful. I love the buffet beside the bed. Yea for hubby's suggestion. What if you painted it? You may love it then and not have to find a new one. Marty, What a great job. That headboard is the star. I love the new colors you brought in. Your master looks fabulous and you didn't break the bank. It all looks just beautiful Marty! 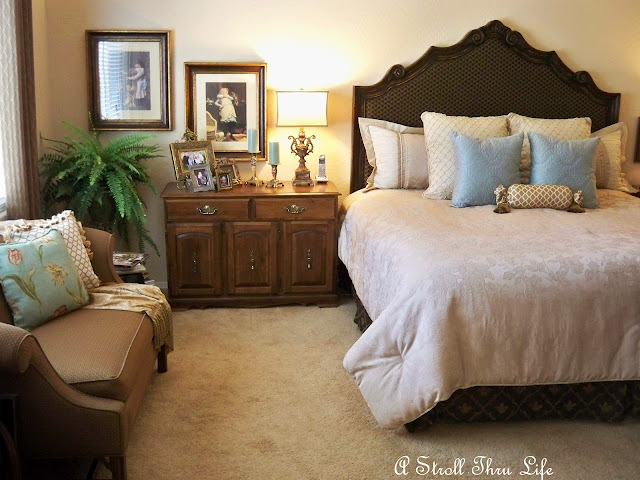 The headboard is just perfect and we are so glad you shared this with us at Inspiration Friday! Lovely job! wish you could come work on mind.Thanks for sharing ! Your "new" bedroom is looking sooo good. The dresser works really well..it gives lots of room for storage as well as pretty things on the top. I really like the fern in the corner instead of the chair. I know what you mean about things working out "for now". I found two different lamps and a set of shams to change my bedroom. I just need a couple of other things to give a different look...for the moment. But you know how it is...when you change one thing, then something else needs to be changed. But that's the fun of it sometimes. Oh, I like the aqua color pops, too. 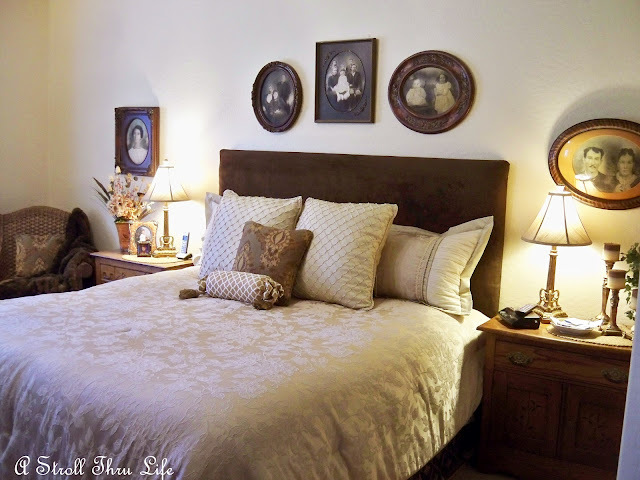 Love that headboard and you've done a beautiful job arranging and accessorizing the rest of the room. It looks lovely. Your room is very lovely. I love the headboard and the blue is just right. Looks lovely Marty. I've always loved your bedroom! 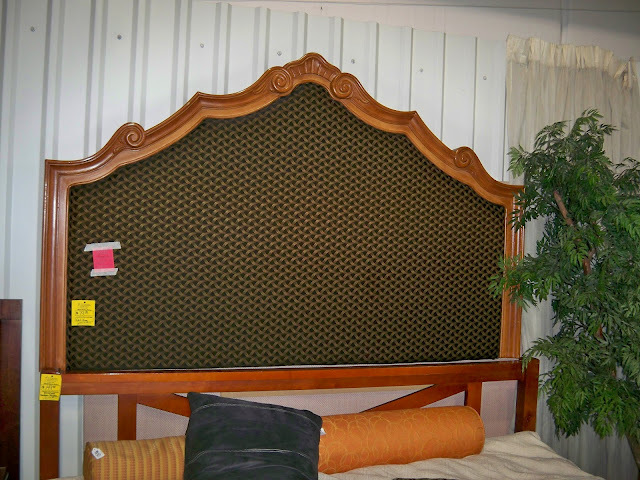 Beautiful headboard! ..And the room looks GORGEOUS! Gorgeous Marty, well done my friend! I don't know how you do it, your energy is amazing! Hugs and happy weekend and take a rest too! hehe. You did a wonderful job of decorating. Everything looks lovely. I think you have an elegant room. Come and do mine now. Beautiful result......and you take such great photographs! to start on mine. And yours did just the trick. Love the headboard Marty! It turned out beautiful! You out did yourself,Marty. 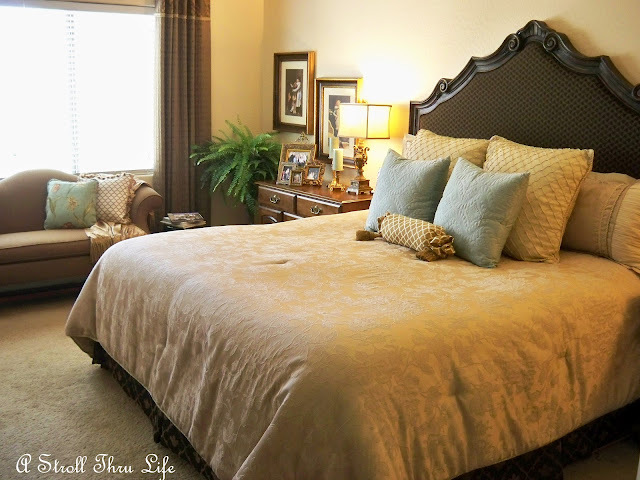 Your master bedroom looks beautiful. I love that you were able to save money my shopping the house.